And, in fact, look pretty damned dumb right now. 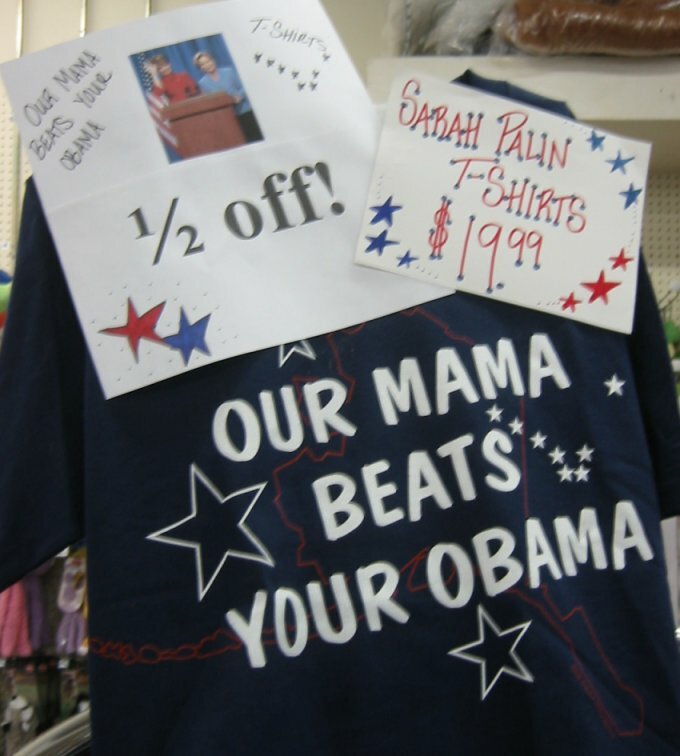 "Our Mama Is Going To Beat Your Obama!" Yeah, have fun scraping that off your back window next Wednesday. I'm not sure the moment ever existed when that one didn't look stupid. Of course, it's pretty damned cold out. Bestine won't help with that. How long until we see "Impeach Obama" stickers? My wife guessed three months. I think they're in pre-press right now. KARL? Oh no, it's Karl! Sorry Jim, he's one of mine, kinda sorta. He's actually one of Cat's and she's one of mine (the woman I married, actually). Oh, and pet your kitties and tell Alexander "Hi". 'Sides, I'm still oglin' those bowls so I can get some ideas for Yule goodies to make. Styopa says hi - he remembers your catpersoness. heh heh - 'nucular' shirts with pellet holes in undisclosed locations? I was thinking they'd make good shop rags, then I realized - no, they'd probably be better for making a mess, rather than cleaning one up.